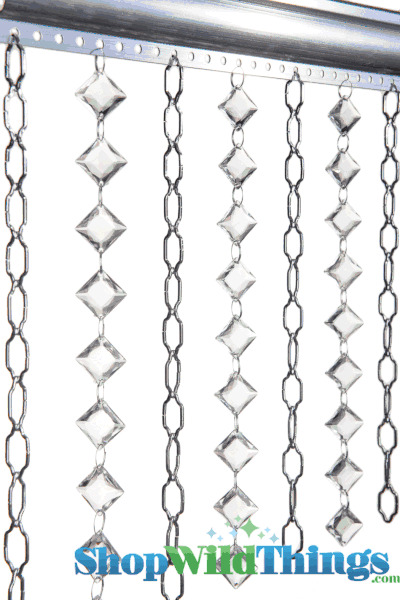 Chain & Crystal Curtain "Cameo & Aces" 35.5" Wide x 6 Feet Long. This curtain includes 9 strands of "Cameo" Aluminum Silver Chain and 8 strands of "Ace of Diamonds" Crystal Garland for a total of 17 strands on an aluminum top bar. The Silver Cameo Beads are 1" Long x 1/2" Wide. The "Ace of Diamonds" high grade acrylic crystals are 3/4" Square. 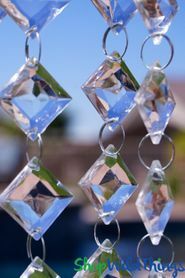 The Acrylic Beads are stunningly faceted to catch the light beautifully. 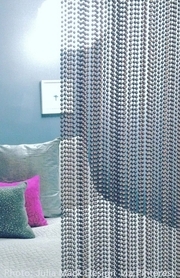 All strands hang from one Silver header rod and the curtain will arrive to you fully assembled and ready to hang. This curtain is made to order in-house at ShopWildThings. Please allow an additional 7 - 10 business days to process. Chain & Crystal Curtain "Cameo & Aces" 3 ft x 6 ft Custom Available!